According to the statistics, Kilimanjaro is one of the top mountain destinations in the world. Every year tens of thousands of people tackle the highest mountain in Africa. In 2016, reportedly, more than 30,000 visitors have reached the highest point at 5,895 meters. 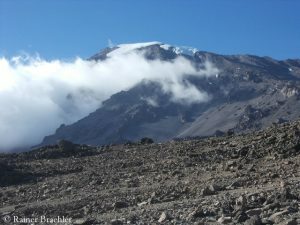 The “Kibo” is said to be a trekking mountain, several easy routes lead to the summit. Only during the rainy seasons in April/May and October/November the tourist flow decreases a bit. Many operators offer hikes to the roof of Africa as a week trip – this short stay also ensures that the mountain is so popular. However, it is less known that every year several hundred tourists suffering seriously from high altitude sickness have to be rescued from Kilimanjaro, and about two dozens of them die, in some years even significantly more.